Do you now to pronounce and prepare Bruschetta??? Watch me and learn how to make both of them. Bruschetta (pronounced bruˈsketta) is the Italian antipasto (starter) consisting of grilled bread rubbed with garlic and drizzled with extra virgin olive oil and salt. It can also be topped with tomato, basil, cured meats and cheese. I’m welcoming the summer 2017 with a tangy version of the classic Tiramisù. This recipe works great with any citrus fruits (grapefruits, lemons, limes) or with Limoncello, the lemon liqueur originated from Sorrento (Almafi coast). This dessert is a great idea for entertaining your guests on a warm summer night and remember, it will taste even better if prepared one day ahead. Have a boost of vitamin C and a splash of summer with the white grapefruit Tiramisù. Wash, dry and grate half of the peel of the white grapefruit, then squeeze out the juice of the whole grapefruit. Set aside. 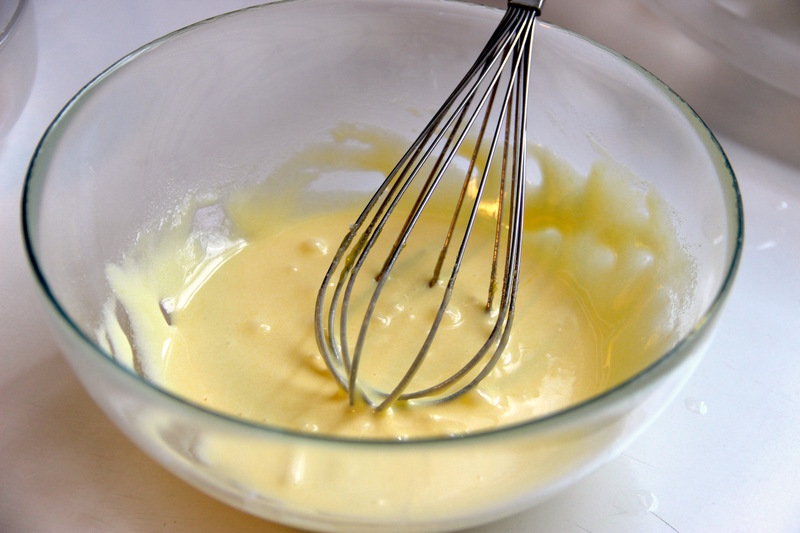 In a large mixing bowl beat the egg yolks and 5 tablespoons of sugar with a hand mixer until creamy. Add the mascarpone cheese and continue to beat until incorporated. In a second mixing bowl, whip the egg whites until stiff then gently fold into the mascarpone cream. In a third mixing bowl, whip the chilled heavy whipping cream until stiff then fold into the mascarpone cream. Stir in the grated grapefruit peel. Pour the grapefruit juice and 1 cup of water into a rim soup plate, add the remaining 2 tablespoons of sugar and stir until dissolved. Spoon the bottom of a baking dish with a little amount of the mascarpone cream. Dip briefly the ladyfingers (one at the time) into the grapefruit and water mixture, then squeeze out the excess of liquid. Make a layer of dipped ladyfingers into the baking dish then spoon evenly half of the mascarpone cream over the ladyfingers. Make another layer of dipped ladyfingers, spoon evenly the remaining mascarpone cream over the ladyfingers. Cover the grapefruit tiramisu’ tightly with cling wrap and allow to rest in the fridge at least 2 hours before serving. Serve garnished with grapefruit slices. Today is a big day, is my precious daughter graduation day from Kindergarten. 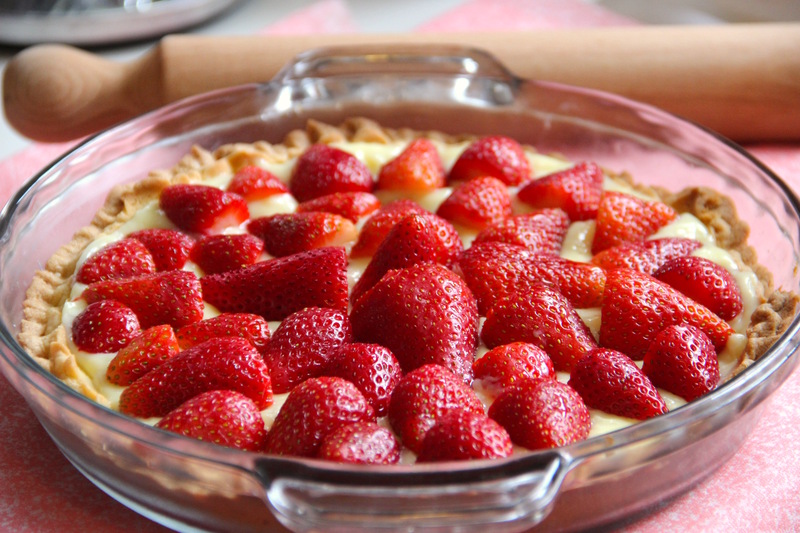 Let’s celebrate this important milestone in her life with a delicious Italian dessert : Crostata di Fragole (Strawberry Tart). For the shortcrust pastry I used my shortcrust recipe that yields more than one shell, so I usually use half of the dough for making a tart and I freeze the remaining half for another cake or cookies. For the filling I made Crema Pasticcera (Custard Cream), and a simple lemon syrup for glossing the fresh strawberries. 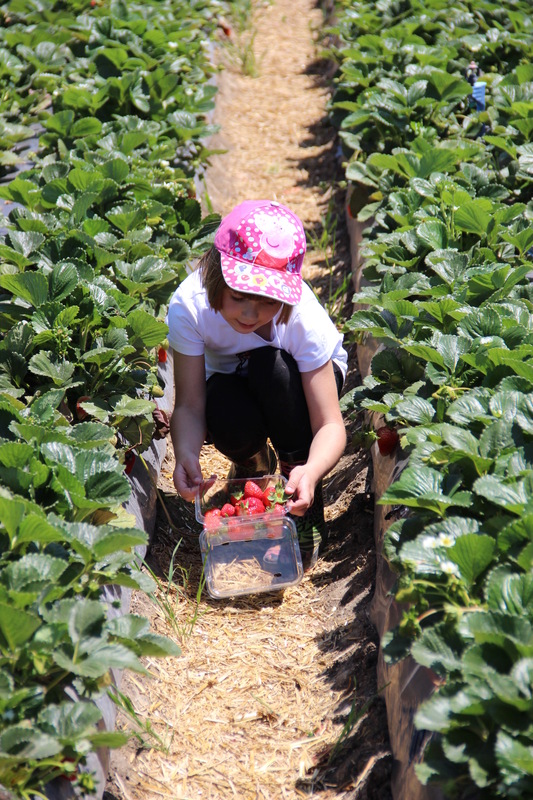 Enjoy this beautiful day with a slice of Crostata di Fragole. Cook. Time : 30 min. Prepare the custard cream beating with a whisk egg yolks and sugar until smooth. Add the sifted corn starch and continue to whisk until incorporated. Slowly add the milk, stirring constantly. Transfer the mixture into a sauce pan, add the vanilla extract and bring to boil. When it starts to boil, reduce the heat and cook until thickens. Remove promptly form heat, pour the cream into a bowl, cover the surface of the custard cream with cling paper and allow to cool. When cooled move into the fridge. Grease with butter and flour a 9.5 inch pie dish. Set aside. Place the flour on a work surface, make a well and add powdered sugar, butter, lemon rind. Work with hands until sandy. Add the egg yolks and the vanilla extract and work until smooth and not sticky. 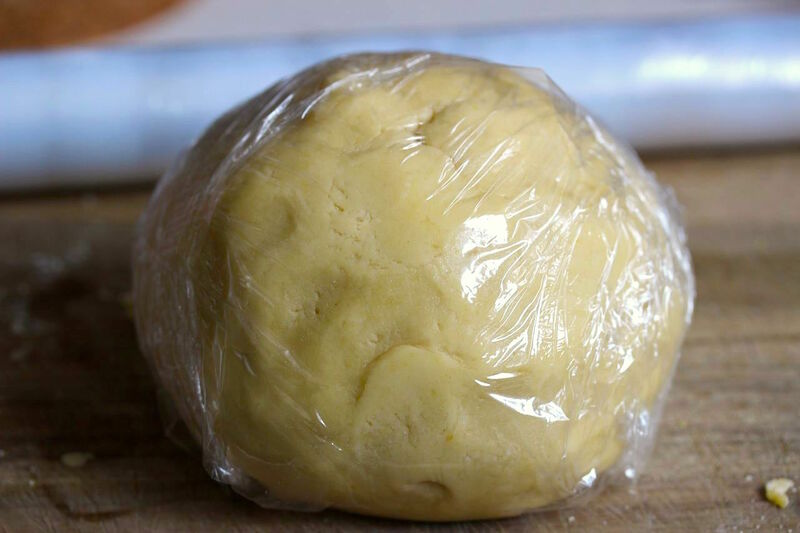 Shape the dough into a large ball then wrap it with cling paper. Let rest in the fridge for 30 minutes. 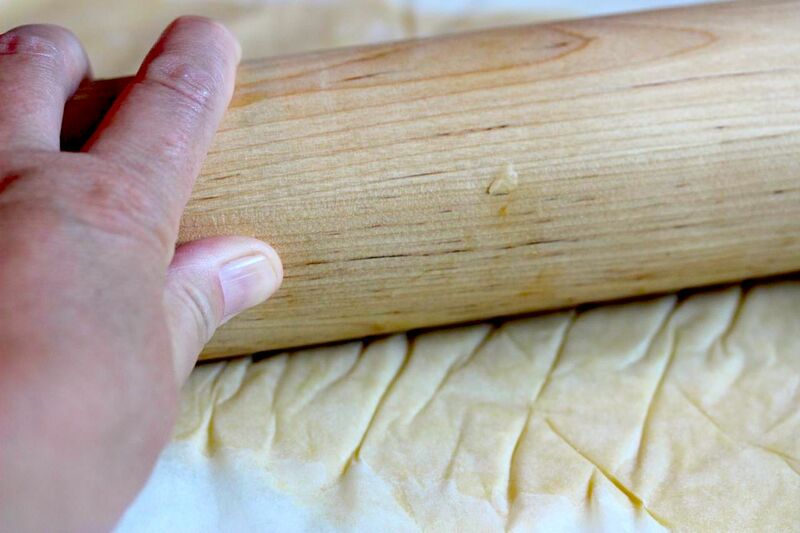 Place the dough between to large pieces of parchment paper then, with a rolling pin, roll the dough approximately 1/8-inch thick. 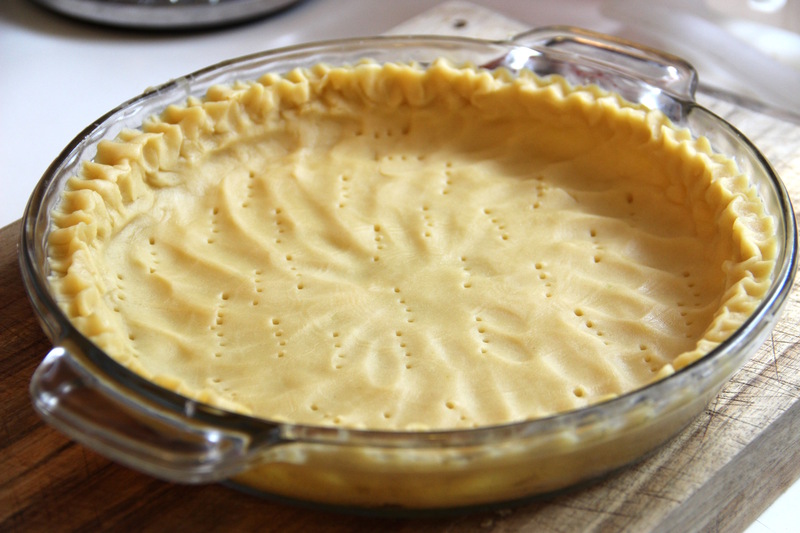 Move the dough into the dish pie, cut the excess of dough, than pinch it with a fork. Cover bottom and sides with parchment paper than place over dried legumes such as beans or chickpeas so the shortcrust pastry will not rise while baking. Bake for 15/20 minutes than remove the paper and the dried legumes and continue to bake for another 8 minutes. Prepare the syrup placing water and sugar into a small sauce pan. Heat at low heat and stir until the sugar dissolves. Bring to boil, than add the lemon juice and cook until thickens. Move the syrup into a small bowl and allow to cool. Cut the strawberries in half. Set aside. Place the custard cream into a sac-à-poche then pipe the cream into the crust with circular motion starting from the center. Spread evenly with a spatula. Decorate the cake with strawberries as you prefer. 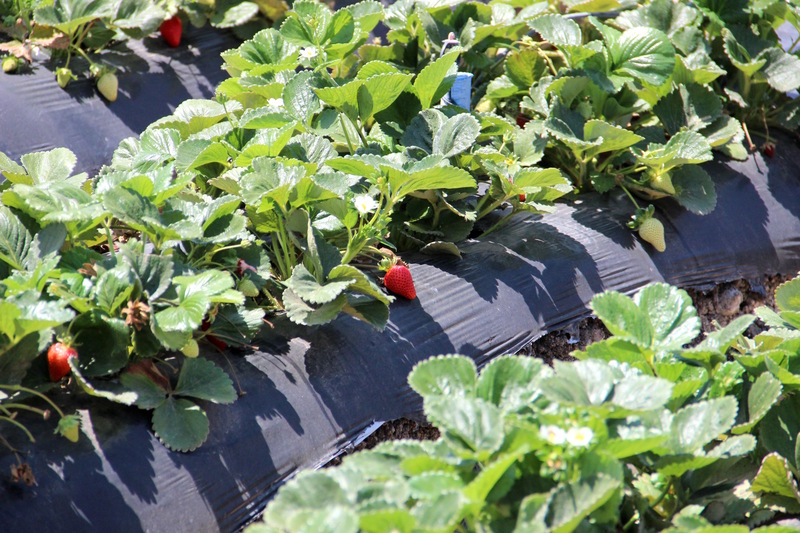 Brush the strawberries with the syrup. It’s always sunny in LA, which reminds me of the beautiful summers spent on my favorite Italian island : Sicily. This dish combines some of the traditional ingredients of the Sicilian cuisine: swordfish, pistachios and lemon. The gnocchi are very simple, made just with semolina flour and hot water. After the first bite you will feel the taste of the Mediterranean sea, a culinary trip without traveling. Pair this dish with a dry and fragrant white wine from the coastal areas such as Vermentino (Liguria and Sardinia), Falanghina (Campania), Salina Island (Sicily). Prep Time : 50 min. On a medium bowl sift the semolina flour. In a large sauce pan bring to boil the water with salt, then remove from heat and add the semolina flour stirring constantly with a wooden spoon, until a firm dough forms. Move the dough on a wooden cutting board, then knead with hand until a smooth dough will form. (Be very careful because the dough will be hot). Shape the dough into little logs then cut them into pieces about 1 inch long. Roll over a gnocchi board, then place them on the floured work surface, well spaced one to another. Set aside. Dice the swordfish then sauté in a a large skillet with olive oil, garlic and pepper. Pour over the wine and cook until evaporate. Set aside. On a food processor whirr together pistachios, capers , herbs, lemon peel, Parmigiano Reggiano, olive oil, salt and pepper to taste. You can also do it with a traditional mortar. Bring to boil a pot of salted water with a tablespoon of olive oil, then dump the gnocchi in. Cook for a couple of minutes or until they rise to the surface. Drain the gnocchi with a skimmer and place them on the skillet with the swordfish. Sauté the gnocchi with swordfish, then remove from heat and add the pesto. Serve hot, sprinkled with Parmigiano Reggiano. I’m finally back home in beautiful Los Angeles and it feels like summer, so let’s prepare a refreshing sorbetto made with healthy and delicious ingredients such as avocado and grapefruit. Sorbetto (Italian sorbet) is a frozen dessert made from sweetened water and fruit juice o fruit puree. Although it is very similar to the Italian granita, the sorbetto has a smoother texture and is usually served after a rich meal as a digestive. Enjoy this sorbetto along with fresh fruit and crushed raw pistachios. Prepare the syrup bringing to boil water and sugar in a small sauce pan, then lower the heat and simmer for 5 minutes. Remove from heat and allow to cool completely. Cut each ripe avocado lengthwise all around the seed then rotate the avocado and separate in halves. Remove the seed, scoop out the flesh and place it into a medium bowl. Mesh the avocado flesh with a fork then add the grapefruit juice and puree with a hand blender until very smooth. Add the syrup and blend again with the hand blender until well combined. Cover with cling wrap and allow to rest in the fridge for at least 4 hours. Pour the mixture into an ice cream maker and churn for 20 minutes. Serve the avocado grapefruit sorbet garnished with crushed pistachios. 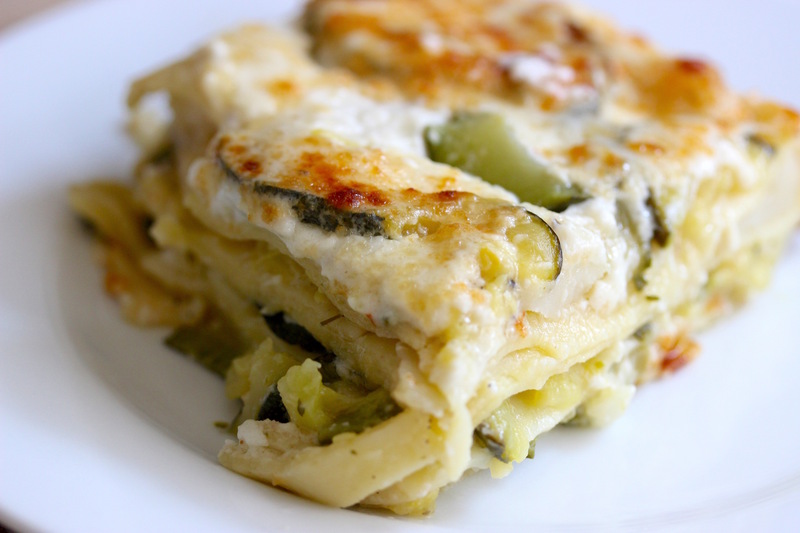 Summer is almost over which means that the majority of my favorite fresh green vegetables won’t be available until next Spring, so let’s prepare a delicious, healthy lasagna made with zucchine (Italian zucchini) and potatoes. 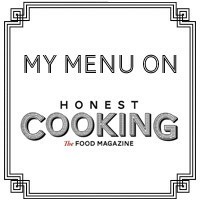 This lasagna is a lighter and yummy alternative to the traditional meat lasagna, perfectly suitable for vegetarians and people with tomato intolerance. For this dish I used only fresh organic produce and the highest quality of dairies. Enjoy every bite. 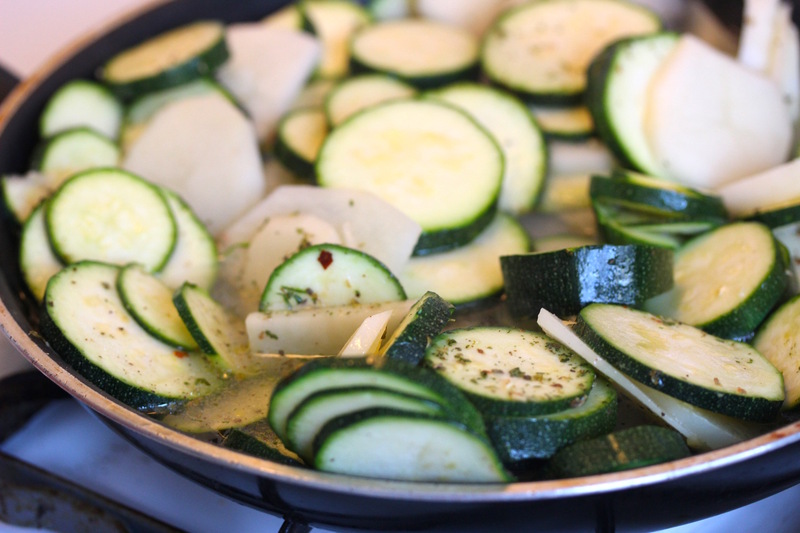 Wash, dry and cut into thin rounds the zucchini. Peel, wash, dry and cut into thin rounds the potatoes. In a large skillet, brown the garlic with Extra Virgin Olive Oil. 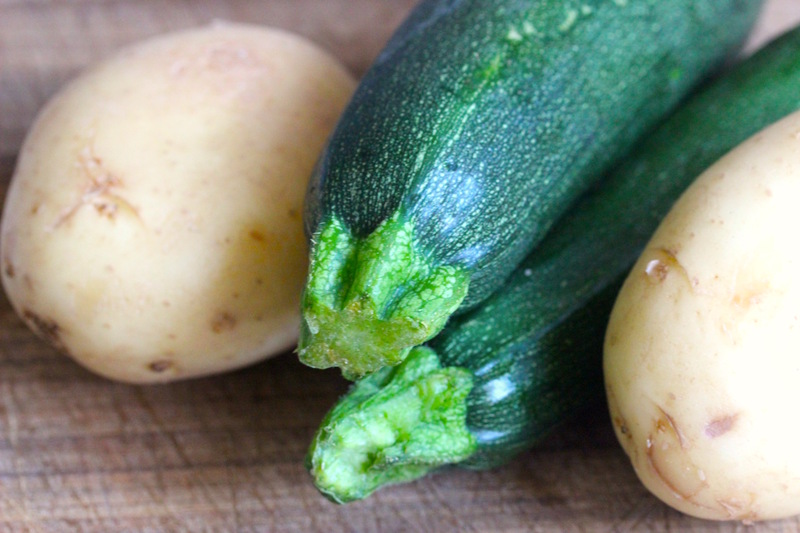 Remove the garlic and add zucchini and potatoes. Sauté for a couple of minutes, than add 1 cup of warm water, salt and pepper to taste and cook at medium heat until tender. In the meantime, prepare the béchamel sauce melting the butter in a medium sauce pan over low heat. Remove the butter from heat then add the flour and stir until smooth. Slowly pour in the warm milk, whisking continuously. Return the mixture over medium heat, add nutmeg and cook until just thick. Set aside. 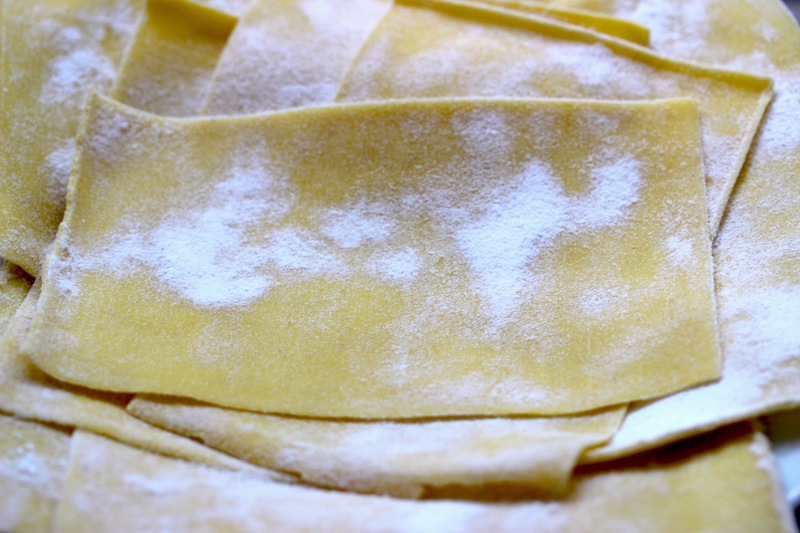 Boil the lasagna sheets on a large skillet of salted boiling water for a couple of minutes, then remove and lay on a kitchen towel to dry. To assemble the Lasagna, grease the bottom of a rectangular baking dish with a knob of butter then spread over a couple of tablespoons of béchamel sauce. 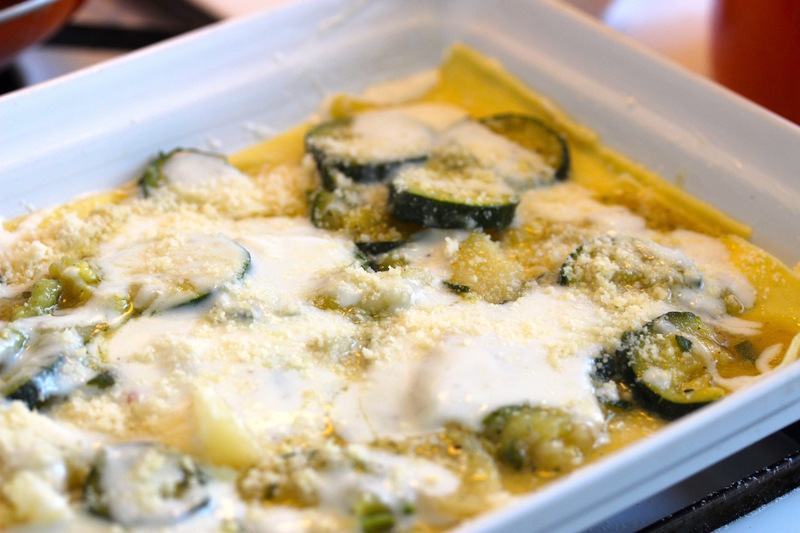 Place the first layer of lasagna sheets than some zucchini and potatoes, spread over some béchamel sauce and sprinkle with Parmigiano Reggiano. Repeat (lasagna sheets, béchamel sauce, zucchini and potatoes, Parmigiano Reggiano) for other 3 times or until all the ingredients are gone. (I usually prepare my lasagna with no more than 4 layers).